Liliphae is a half-serious/half-just for fun cosplayer and model who made her debut at FanimeCon 2014 in San Jose, California. 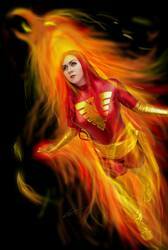 She subsequently became known for her unwavering involvement in the Northern California cosplay community. Since then, she has traveled up and down the state of California and beyond to guest, attend, and judge at conventions and has learned a lot about the art of cosplaying and the effort and work that it takes to make something you're proud of.